Naseemuddin continues to describe injuries to Richard Oland's head - location, type, measurements etc. Reminder warning: some of these tweets will be graphic. Head wounds are largely sharp force but also some blunt force marks. Many sharp wounds run parallel to one another suggesting rapid blows in “quick succession” says Naseemuddin. #17 is 8.5 cm in length, transverses the full thickness of the scalp and skull - "like a chop wound," goes all the way into the cavity where the brain is, he says. #18 also caused fracture and displacement of the underlying skull bone. Wounds were so numerous and in many cases in such close proximity Naseemuddin initially miscounts how many there are - double counting one wound. Many of the blunt force injuries reveal a “cross hatching pattern” on the face of the weapon used. Damage to the back of Oland’s head is extreme. “The ***ulative effect of these injuries is that the skull has caved in,” says Naseemuddin. "You're going to have to slow down," Justice Terrence Morrison tells Naseemuddin. There’s no possible way I’m going to be able take notes, he says. Naseemuddin cannot say if it was one weapon with a blunt side and a sharp side or multiple weapons used in the attack. In this case, there was no weapon, "it would be conjecture really to suggest what caused this," he says. A year later Naseemuddin is interviewed by police who want to know if Oland could have survived for some time and made some thumping noises later in the evening heard by Anthony Shaw and John Ainsworth. Absolutely not, he tells police. Crown Prosecutor expressing interest in Naseemuddin’s observation that injuries on the left side of Oland’s head are much more serious than those on the right. “Much more significant injuries” on the left he says. Top of Oland's skull was cut off. Brain removed. Both examined more closely for injuries, he says. Not clear if she might be suggesting that is a clue to whether the attack was right handed or left handed. Oland was facing attacker at start of the assault and face down (facing away) at the end. Oland trial breaks for lunch. A couple of people in the public gallery remark they don't feel much like eating after the graphic photos and testimony. Back at 1:30 p.m.
Damage so severe tissue was not holding together when the brain was removed for examination. Again Naseemuddin observes damage is most severe on the left side. “Significant more injury to the brain on the left side,” he says. Naseemuddin is asked about alcohol in Oland’s system. A bit in the urine but none in the blood which indicates some consumption several hours before death he believes. Naseemuddin is a very fast talker. Judge reminds him to slow down. Defence cross examination begins with questions from Micheal Lacy. Can you tell from your findings if there were one or multiple attackers? No. Can you tell if one or more attacker was right or left handed? No. Crown prosecutor Jill Knee asks Naseemuddin about cause, mechanism and manner of death. Multiple sharp and blunt force injuries to the head. Combination of extensive blood loss and direct trauma to the brain. It's not an accident, it's not a suicide, "it appears to be a homicide"
Defence lawyer Michael Lacy begins cross-examination. Says Naseemuddin can't say whether there was one or more assailants. He agrees. Can't say if one or more were left or right-handed. He agrees. Have you ever seen a cross hatch pattern on a blunt force injury like in this case? Never seen a hammer injury on a body of any sort in my work, says Naseemuddin. Did police ever bring various kinds of weapons to you to see if one of them might have been the type of weapon used in this case? No. Hard for me to match a weapon to any crime once body is no longer available for comparison. And no police officer has ever done this exercise with you of showing you a photograph of a type of tool? reiterates Lacy. No. Lacy shows a picture of a hammer head with a waffle or cross hatch pattern on its head. Could a hammer head like this have caused the injuries you observed. Possibly. Did police ever show you a picture like this and ask you if this type of weapon might have been used? No. Now asking about the sharp force injuries. So you presume there is one weapon with two distinct edges - or separate weapons? That’s right. Did police ever bring anything to you to ask if it fit any of these two possibilities? No. Is it fair to presume whatever weapon was used the weapon would have significant blood on it? I would agree with that? And would you expect an attacker to have significant blood on them? Crown objects - Naseemuddin is not an expert on blood spatter. Question disallowed. Whoever perpetrated this beating likely had blood on them and their clothing? asks Lacy. Crown prosecutor Jill Knee objects - not within his area of expertise, she argues. Lacy contends he can offer opinion based on his experience. This was a very bloody situation in terms of how the deceased met his death? asks Lacy. I would agree. Anything in your examination suggest Richard Oland had any physical problems that would prevent him from defending himself in an attack? No. Is it possible the fractured orbital bone was caused by a fall to the floor? Yes. Would you agree the attack was vicious? Yes. There were a significant amount of injuries? Yes. Defensive injuries on the hands come first? Yes. Beating continue once Oland is on the floor? Yes. Does it take considerable force to break the skull? Yes. And the weapon had to be strong enough to break the skull but not break itself? Yes. It would have taken considerable force to break the skull? Yes, The weapon had to be strong enough to break the skull without any portion of the weapon breaking? 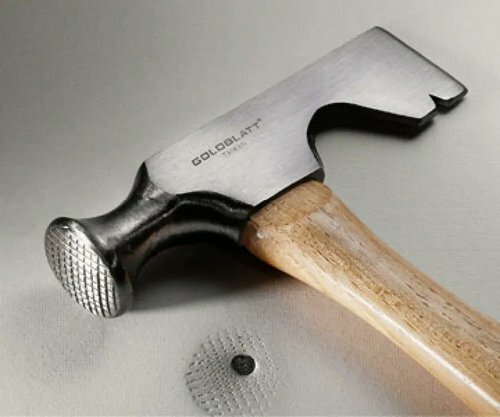 Would breaking a skull in an attack like this be loud? I can’t say for sure but common sense suggests yes. This again refers to the noises witnesses described hearing coming from the victim's office around 8 pm. 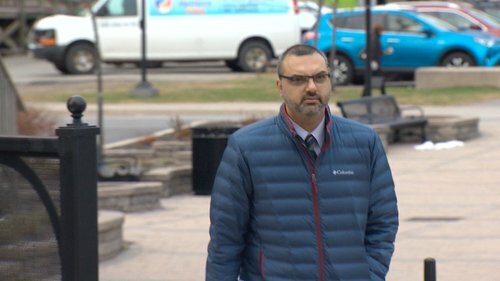 The defence contends the noises were of the killing and has submitted timestamped video of the accused across town in Rothesay shopping with his wife around 7:40 p.m.
Dr. Ather Naseemuddin concludes his testimony. Sgt Mark Smith is due to return to the witness box but is ill. Court adjourns early. #Oland trial is done for the day. Crown expects to call forensic toxicologist Dr. Albert Fraser tomorrow and then the head of the SJPF's forensic unit Sgt. Mark Smith will return to the stand.